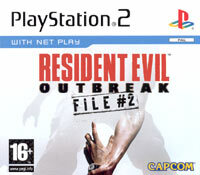 File #2 is the accompanying upgrade addition to RE: Outbreak. But it's a bit more than that, as it is pretty much a whole new game on its own. You're also able to combine the two. Raccoon City is of course the doomed location where the Umbrella Corporation's biological viral experiments went awry, creating a horde of zombies. As one of the few survivors having to fight to avoid becoming zombie food (and getting closer to more of Umbrella's secrets), you can now also for the first time team up with three extra friends across the internet. The choice of characters expands the scope and replay value. There's a wide choice of 8 characters, each with their own abilities, strengths and disadvantages. The 5 new levels to conquer also include the woods around the city, as well as the zoo (expect a few new monsters and freaks besides your classic zombies!). Again there is no lack in atmosphere and scares, with heart-stopping thrills and bloody action.